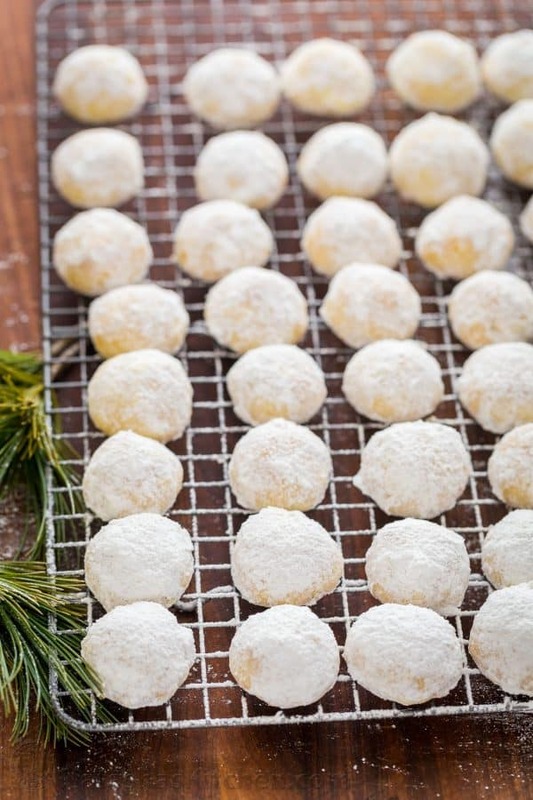 These darling almond snowball cookies just melt in your mouth! They are perfect for your Christmas cookie platter and gifting. We love them year round but they are so popular this time of year because they look like little snowballs. P.S. They freeze really well so they are make-ahead cookie #SCORE!! Make them fully including powdered sugar and just dust with fresh powdered sugar once they are thawed and sitting on your cookie platter. 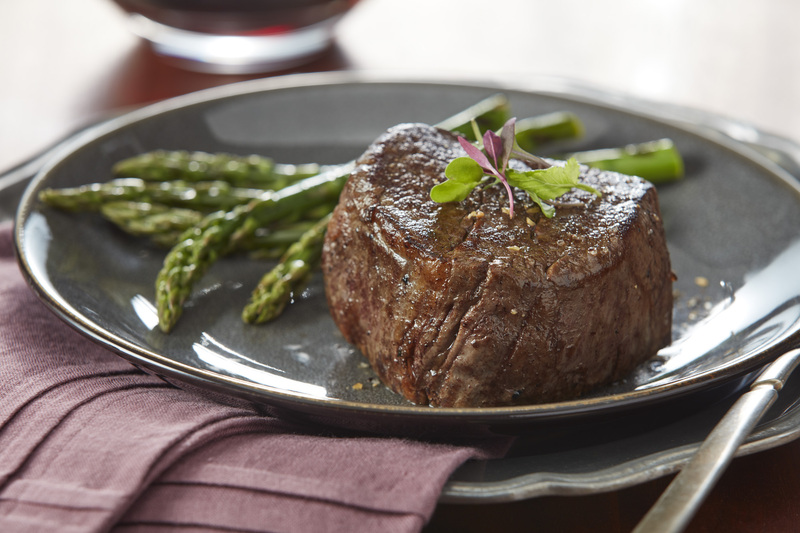 They’ll taste just as good as the day you made them! Once they are on your cookie platter, dust with extra powdered sugar to make them look like they’ve received a fresh coat of snow :). 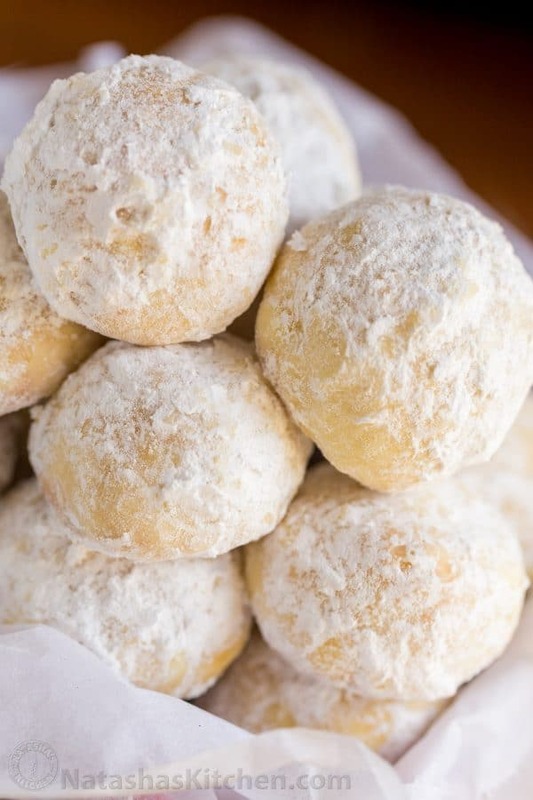 Print Almond Snowball Cookies (VIDEO) Prep time: 19 mins Cook time: 11 mins Total time: 30 mins Darling almond snowball cookies that melt in your mouth! 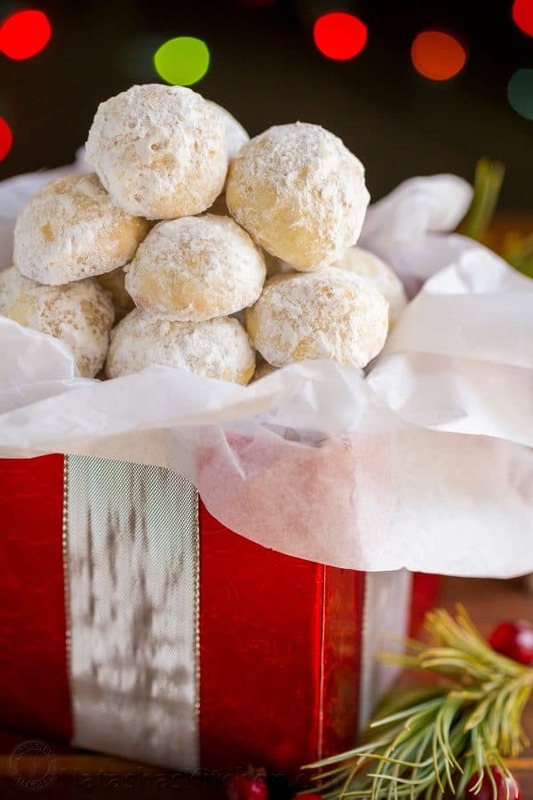 Almond Snowball Cookies are perfect for Christmas cookie platters and gifting (make-ahead recipe!) Author: Natasha of NatashasKitchen.com Skill Level: Easy Cost To Make: $6-$8 Serving: 40 snowball cookies Ingredients 16 Tbsp (1/2 lb) unsalted butter, softened ½ cup (62 grams) powdered sugar, plus more for rolling cookies 1 tsp vanilla extract 2 cups (250 grams) all-purpose flour *measured correctly ½ tsp salt (we used fine sea salt) 1 cup (100 grams) almond finely ground meal or almond flour ½ Tbsp orange zest from 1 medium orange Instructions Prep: Preheat oven to 400˚F and line a cookie sheet with parchment paper. Use an oversized ¾ sized cookie sheet or use 2 regular half sheets. 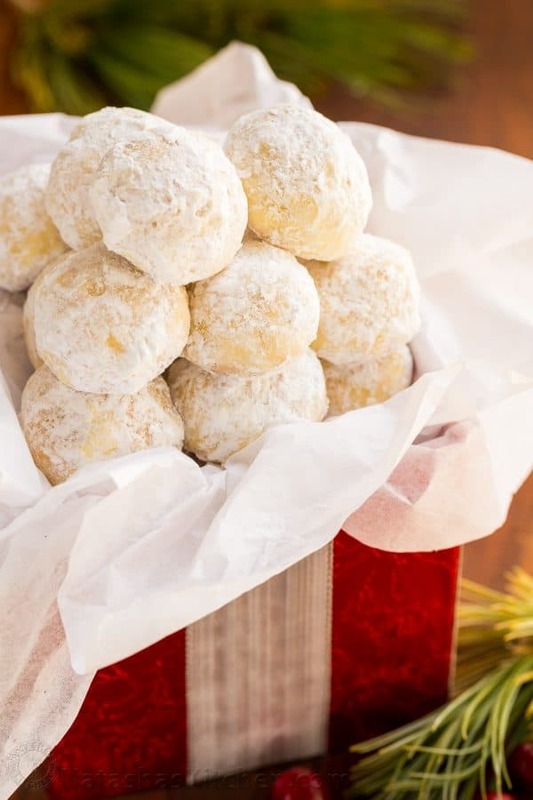 How to make Almond Snowball Cookie: In a large mixing bowl, using an electric hand mixer, beat together ½ lb softened butter, ½ cup powdered sugar and 1 tsp vanilla extract, just until smooth. Add 2 cups all-purpose flour in 3 increments, mixing on medium/low speed between each addition, then add ½ tsp salt and 1 cup almond meal, mixing to combine. 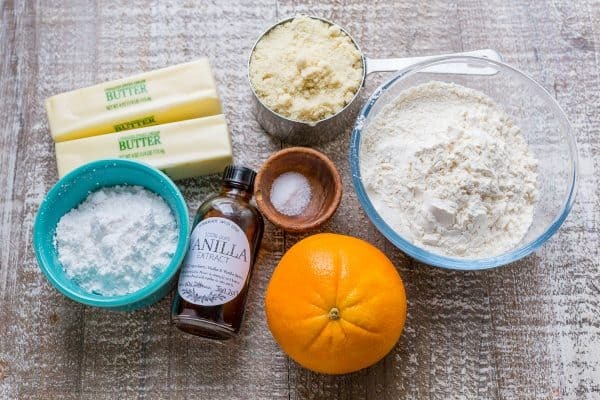 Add ½ Tbsp orange zest and fold with a spatula until it is well incorporated. The dough should stick to the spatula but not to clean fingertips. Roll dough into 1-inch balls (a cookie scoop makes this process easy, just scoop dough onto the baking sheet then roll into balls with your hands). Place cookies on baking sheet 1-inch apart. You should get 35-40 cookies. Bake at 400˚F for 11-13 minutes (I bake 11 min for softer cookies), or until edges are lightly golden. Transfer to wire rack and cool 5 minutes. Fill a bowl with 1 to 1½ cups powdered sugar and while cookies are warm (not hot), roll them in powdered sugar then place on wire rack to cool completely before rolling them a second time in powdered sugar. **See storage tips Notes *Measure flour by spooning into measuring cup then scraping off the top. P.P.S. Next week I have a new video recipe to share with you that will be the highlight of your Christmas cookie platter. It is a gem of a recipe that was shared with me by a friend and I CANT WAIT to share it with you all! I hope you, yes YOU personally, are having a Merry Christmas season. Is your tree up? Are you done shopping? Did you order Christmas cards? So many questions!! The post Almond Snowball Cookies (VIDEO) appeared first on NatashasKitchen.com.